TORONTO (AP) — It’s taken the 2019 Orioles just five games to match the team’s longest winning streak from last season. Andrew Cashner pitched six shutout innings and the Orioles extended a road winning streak to four for the first time since 2016 with a 2-1 victory over the Toronto Blue Jays on Tuesday night before another small crowd at Rogers Centre. Baltimore had one four-game winning streak overall last year, when the Orioles finished with a big league-worst 115 losses. Jonathan Villar had two hits and scored once for the Orioles, who opened by winning two of three at the New York Yankees. With back-to-back wins in Toronto, they’ve strung together four road victories for the first time since July 5-16, 2016, at the Los Angeles Dodgers and Tampa Bay. “When I was looking ahead to the season, this is how I was hoping we would play,” first-year manager Brandon Hyde said. Baltimore’s only four-game winning streak last year was from May 9-12 against Kansas City and Tampa Bay. 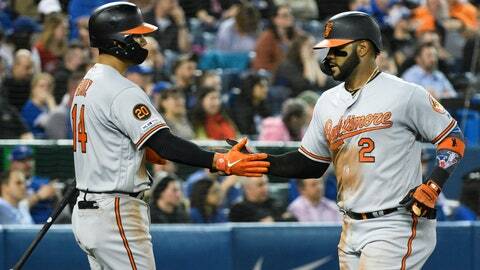 Baltimore had lost 10 straight at Toronto coming into the series. Boosted by a $1 hot dog promotion, the game drew 12,110, up from 10,460 in Monday’s series opener, Toronto’s smallest crowd since 2010. Cashner (1-1) allowed four hits, all singles, struck out three and walked three. He stranded the bases loaded in his final inning when Rowdy Tellez flied out on his first pitch. “For him to compose himself and make a pitch to get out of the inning after 88 pitches at that point was huge,” Hyde said. Cashner didn’t allow a hit until Justin Smoak’s one-out single in the fourth. Danny Jansen followed by grounding into a double play. Paul Fry worked two innings and former Blue Jay Miguel Castro got his first save despite allowing Tellez’s second homer this season. After throwing 12 consecutive scoreless innings to start his season, Marcus Stroman gave up Dwight Smith Jr.’s leadoff single in the sixth and Villar’s triple. Mancini followed with an RBI single. Stroman (0-1) allowed two runs and nine hits in 5 2/3 innings. Held hitless through three innings for the second straight night, the Blue Jays are hitting .018 (1 for 55) in the first three frames so far this season. The Orioles are the first team since the 1991 Padres to have four different relievers record saves in their first four victories of the season. Castro joined Richard Bleier, Paul Fry and Mike Wright. Orioles: Baltimore dealt minor league C Andrew Susac to Kansas City for cash. Blue Jays: Toronto traded OF Kevin Pillar to San Francisco for INF Alen Hanson, RHP Derek Law and minor league RHP Juan De Paula. … The Blue Jays acquired OF Socrates Brito from San Diego for minor league OF Rodrigo Orozco. Toronto OF Randal Grichuk signed a $52 million, five-year contract. Grichuk had been eligible for free agency after the 2020 season. Toronto released RHP Bud Norris from his minor league deal. Blue Jays: OF Dalton Pompey (concussion) was placed on the 60-day injured list. Orioles: RHP Nate Karns (0-0, 0.00) will open for Baltimore in Wednesday’s series finale. Karns opened with two scoreless innings against the Yankees on Saturday. Blue Jays: RHP Matt Shoemaker (1-0, 0.00) is 2-1 with a 2.88 ERA in four starts against the Orioles.